While Princess Eugenie's fashion choices aren't followed as closely as Meghan Markle's or the Duchess of Cambridge's, the royal has definitely carved out her own stunning sense of style over the years. Often pairing designer with high-street, the 28-year-old is a big fan of bold colours and on-trend prints. And recently, she posted an Instagram wearing perhaps her most favoured, signature print – florals. Princess Eugenie shared a sweet throwback to her 2017 visit to the Alder Hey Teenage Cancer Trust Unit, which she went to alongside her mother, Sarah Ferguson. In the pictures of the royal engagement, Princess Eugenie is seen wearing a stunning black and red floral dress, finished with an on-trend cross print. On #worldcancerday I’m looking back to my visit to Alder Hey Teenage Cancer Trust Unit. @teenage_cancer brings world class cancer care to young people across the UK and alongside my sister Bea and mum @sarahferguson15 I’m a proud patron of this special charity. And although it’s not been revealed where Princess Eugenie’s actual dress came from, the look provides the perfect inspiration for dressing in dark florals this winter. Eugenie paired her chic mini dress with a pair of black tights and matching black boots, creating a gorgeously stylish look that still appears laid-backed and sophisticated. And if you’d like to mimic her style, there are plenty of options on the high-street for rocking a similar look. 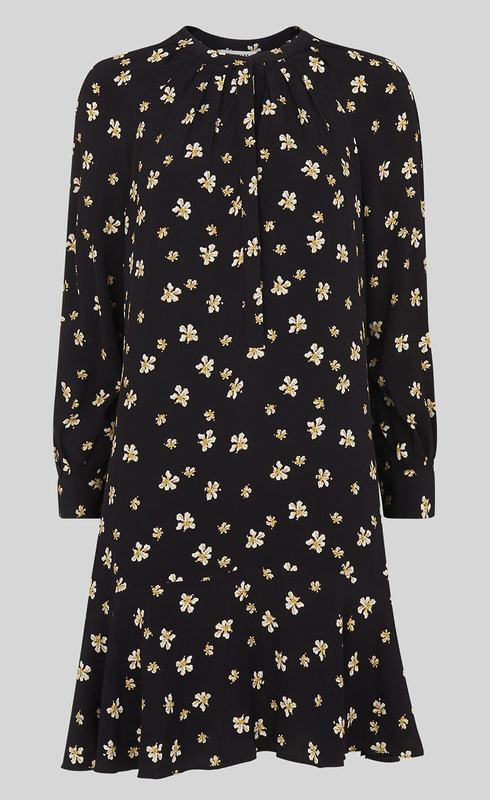 This chic but simple shirt dress from Whistles is a great match for Eugenie’s own dress, and available at a reasonable £149. Perfect for work or play, it’s one of the most vertasile dark floral items out there. 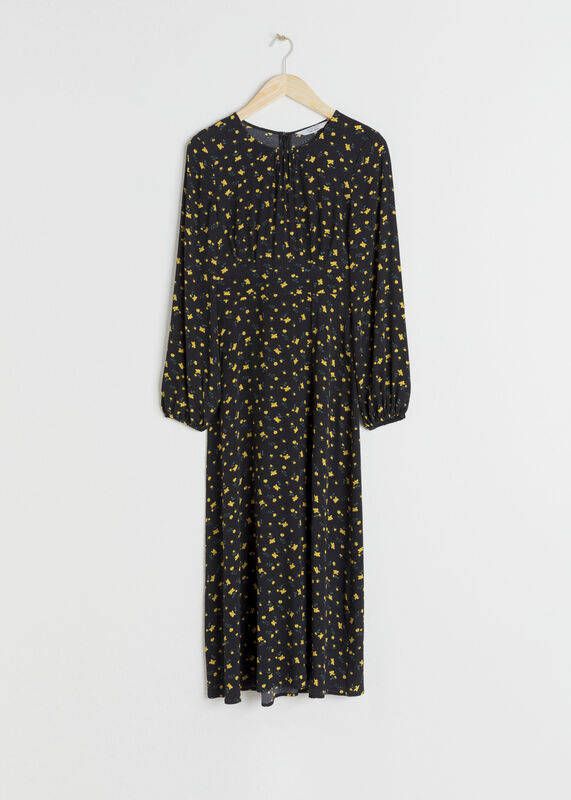 Or if you’re looking for something more affordable, this longer-length floral midi is the perfect way to wear the dark floral trend when it’s still freezing outside. It’s from & Other Stories, and will set you back only £79. Style yours in a similar way to Eugenie’s, with a pair of tights and boots – minus the tights as it gets warmer. You can buy it here. Or, if you’re on the hunt for a similar dark floral trend in skirt form, this elegant Jaeger pick is a great option. And even better, it’s in the sale at John Lewis, reduced to just £70! Buy it here. 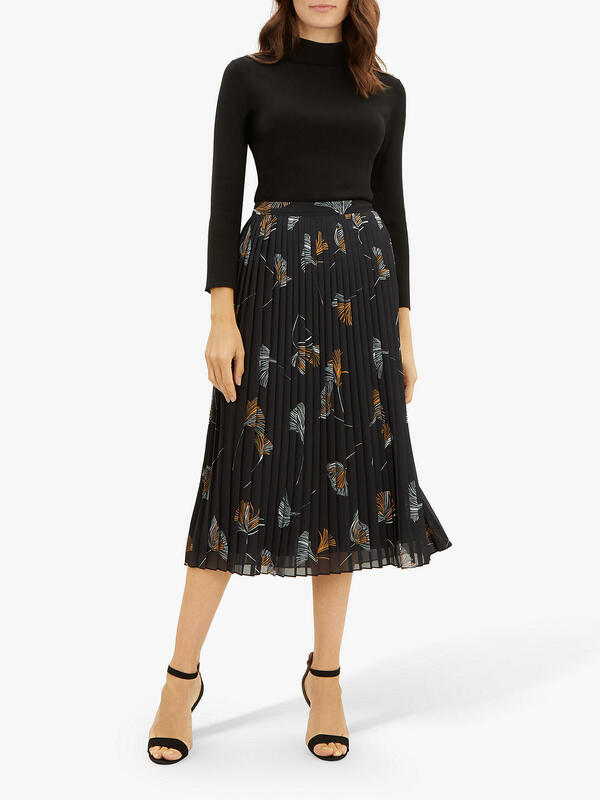 A thin polo neck works brilliantly with this kind of midi skirt, as does a slouchy t-shirt or jumper – it’s up to you. Whatever you decide, you can’t go far wrong taking floral fashion inspo from Princess Eugenie.